Stock photo of the Longji Rice Terraces or Dragon's Backbone Rice Terraces. Every spring the Longsheng terraced fields in Guangxi Province of China are irrigated and the irrigated fields look like layers of bright mirrors. When it comes to the late July and the early August, a green sea of paddy rice lures you deeply. And the terrace filed greets you with the golden blankets of the ripe rice in the late September and early October. Snowed terrace field in winter is also awesome. Overall, the spring irrigation time and autumn harvest time are the best time for viewing terrace field. This image belongs to the travel and nature stock photo library. This stock photo of Longsheng (Longji) Rice Terraces is available for licensing for commercial and editorial uses including websites, blogs, books, magazines, brochures and advertising. Restrictions may apply for images which contain third party copyrighted material or sensitive subjects. Photos of artwork are for editorial use only. 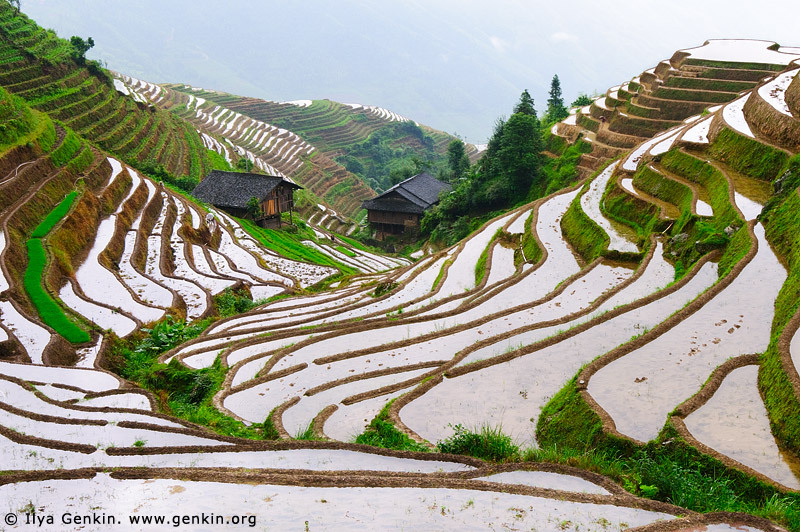 This image id CHINA-LONGSHENG-0001 of Longsheng (Longji) Rice Terraces, is copyrighted © by Ilya Genkin. This is not a public domain image.